Tennis in San Diego: Where to Shop, Play and More! Tennis in San Diego: Where to Play, Shop and More! San Diego is known for having the best weather of any city in the country. 80 degrees and sunny makes for very happy residents, especially the large tennis population. Looking for some tennis tips in the Golden State’s fairest city? Look no further. If you have heard of San Diego, you have probably heard of Balboa Park. The 1400 acre monstrosity features open space, museums, golf, biking and most importantly, an impressive 24 court tennis facility highlighted by a 4,000 seat stadium. Memberships are available for locals, and daily passes are available for visitors. It is widely renowned as one of the best public tennis facilities in the nation! Check out the facility HERE. Coronado, home of the famous Hotel Del Coronado, also boasts a gorgeous tennis center including 19 world class tennis courts. Reserve a court, sign up for a tournament, or go watch some great tennis at a stunning location! Check out the facility HERE. Do you love high-end tennis gear at great prices? Do you love supporting local mom-and-pop shops? Ray’s tennis is the spot for you. Started in 1969, Ray’s Tennis has grown into one of the largest specialty tennis stores on the planet! Visit their site HERE. Looking for a family-friendly event in San Diego? Cruise up to Carlsbad to check out the San Diego Aviators, a World Team Tennis organization. Watch Madison Keys, #1 Junior in the world Taylor Fritz and other great players in this fast-paced format. Feeling fancy? 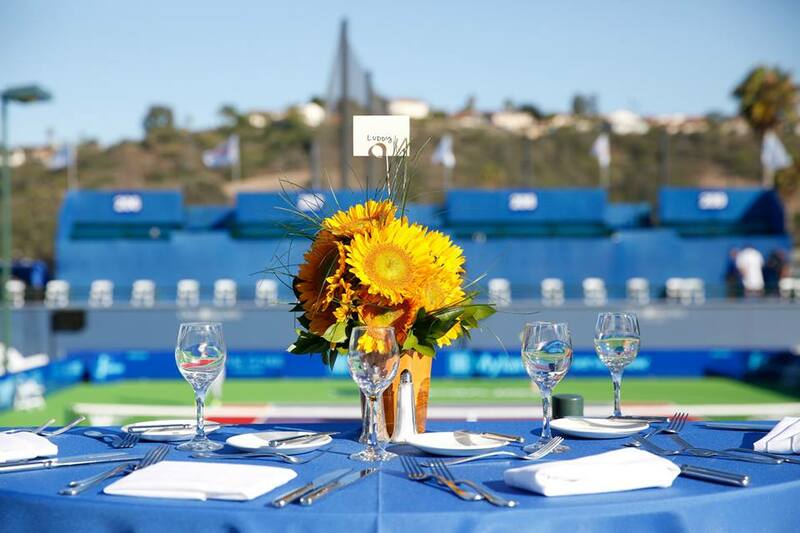 Opt for the First Class Experience and watch tennis while enjoying fine dining and in-seat beverage service! Visit their site HERE. Want to work on your game in San Diego’s perfect weather? Let a certified, experienced PlayYourCourt pro help take your game to the next level. Click the link to find great Tennis Lessons in San Diego. Greatest blog I’ve read in a while!